If you have begun searching for information on buying your first home, you are likely to find information about down payment assistance programs. While getting “free” grant money to make your down payment sounds fantastic, these programs can cost you big time. Down payment assistance programs are not a wise financial decision for home buyers. Below you will find a number of reasons to avoid these programs, and what the alternative choices are. Let’s start with the good news. If you have zero savings and want to buy a home, down payment assistance programs can provide an easy way to make your down payment. If you qualify for a down payment assistance or first time home buyer program, these are the advantages. When you participate in a down payment assistance program, your mortgage financing options change. Considered a higher risk mortgage, these programs come with high long-term costs. If you have a close friend or family member that is willing and able to help, this “Gift” can help you with your down payment and closing costs. Keep in mind that this money must be documented as a “Gifted Funds,” and cannot be considered a personal loan. A signed gift letter will be required to show that these funds will be transferred directly to the title company at closing. Selling something you own to build your down payment funds is also an option. Assets being sold, such as a car, boat, collectable item, or anything else of value must be appraised. Documentation is required to prove your ownership. After being sold, these funds can be used toward your down payment. While one of the reasons that some people consider a down payment assistance program is because they have no savings, it is definitely a better financial choice to save. If your goal is to buy a home in the future, create a saving plan that works for you. This article has great ideas for small ways to contribute to your savings that add up quickly. The Federal Housing Administration had first time home buyers in mind when they created a loan program. Unlike a conventional mortgage with a 20% down payment, an FHA loan requires as little as 3.5% down to qualify. FHA loans also have a lower credit score requirement at 580. Learn more about FHA loans here. At TexasLending.com we have a First Time Home Buyer Conventional home loan that is similar to the FHA loan in that is requires a lower down payment. At a 3% down payment of the home’s value it’s an achievable amount to save. If you are looking to buy a home in a rural area that is covered by the USDA loan program, you could skip the down payment entirely with a 100% loan. The United States Department of Agriculture offers a No Down Payment offer on rural homes for qualifying buyers. Learn more about USDA Loans here. 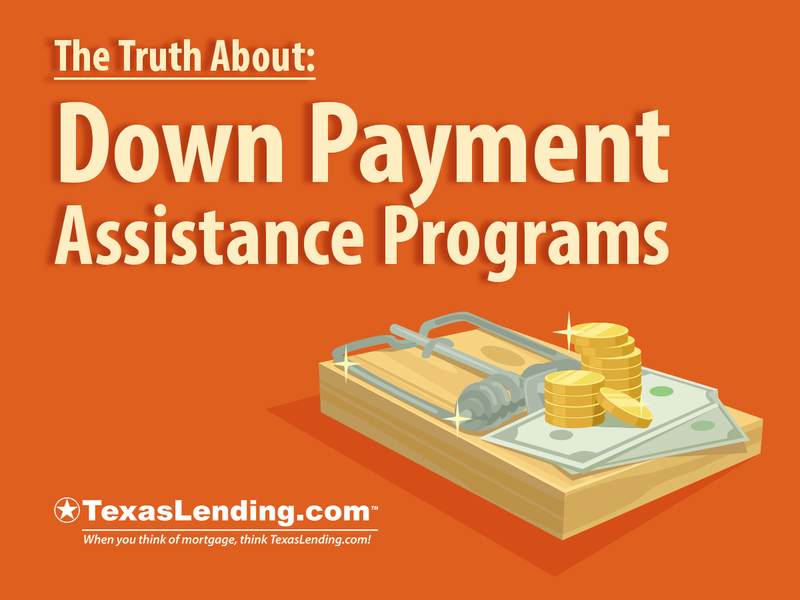 Avoid the down payment assistance program trap. Our licensed mortgage consultants are ready to talk to you about your best mortgage options. We will help you make a smart financial decision, when buying a home. At TexasLending.com we want our customers to be well informed and financially healthy. Reach out to us today to start the home buying process.